One of my favorite activities each day is watching new Youtube videos from my subscribed channels. I follow a lot of channels, but recently I have found a new channel that has quickly become one of my favorites! It is called Kyde and Eric (pronounced Katie and Eric). They are an American couple who now live in Japan and their channel is a vlog style format following their adventures in Japan as well as different countries they visit from time to time. Kyde and Eric have very likable personalities and it is very interesting to see the culture and environment in Japan. They have been making videos for years so the quality is very good and they have developed a nice following without getting too popular yet. If you like vlog style channels or travel style videos, I highly recommend checking it out! Here are a few videos to get started. Enjoy! 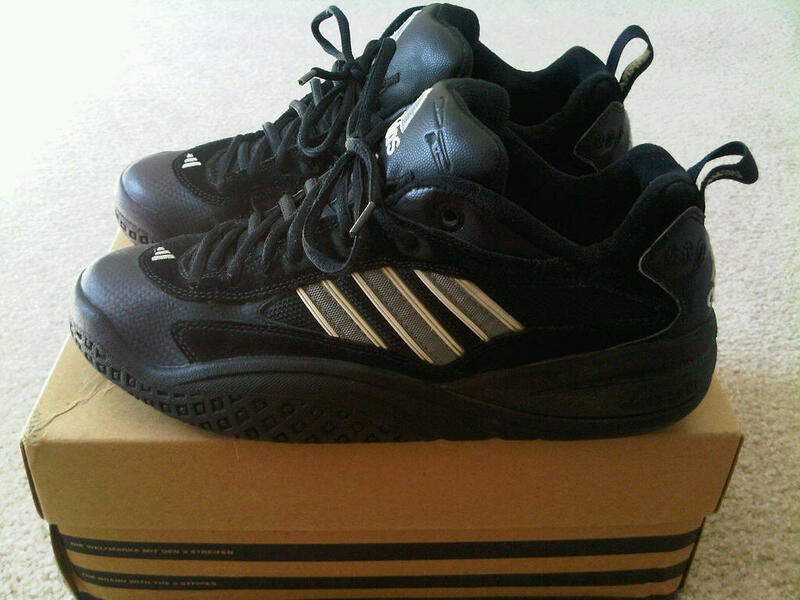 adidas Mirra II - This is a signature shoe from BMX freestyle rider Dave Mirra. It is his 2nd signature shoe and features a black and white color with silver stripes. 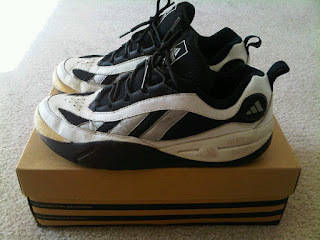 These were from 1998 and have a unique style with the forward slanted stripes and wavy outsole design. They also feature adiprene cushioning and Dave Mirra details on the heel tabs. adidas Mirra III - I was a BMX rider back in the day and since I liked the Mirra II's, of course I had to get the Mirra III's. They have a more traditional black color with silver/white stripes. They also feature a similar outsole design but have a Kevlar toe for extra durability. These came out after the Mirra II which would have been around 99-2000. 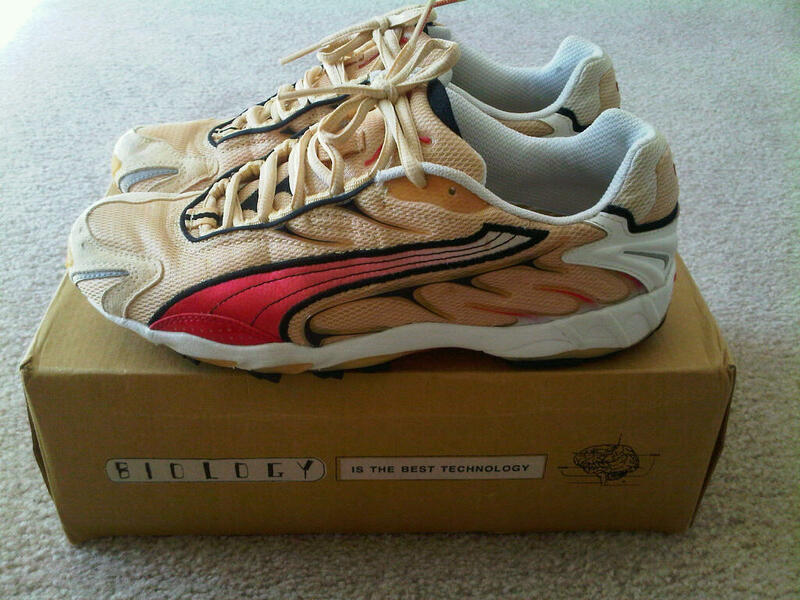 Puma Cellerator Inhale - I was also into running around this time and one of the shoes that caught my eye was the Puma Cellerator Inhale. It has a unique jute colored upper material, faded red logo on the sides, and claw like pattern on the sole. 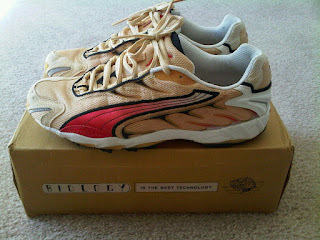 They also feature the Cell cushioning technology. Unlike the other shoes, I didn't wear these ones as much so they are actually still in very good condition! 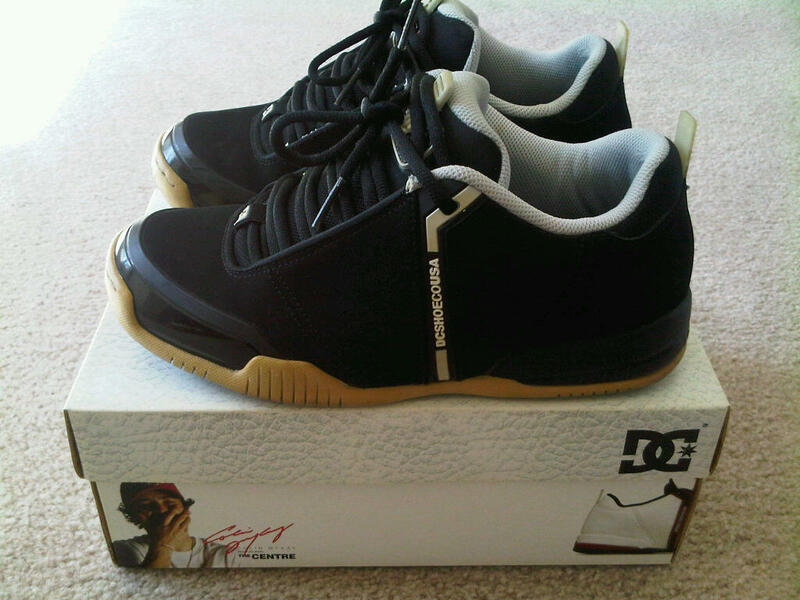 DC Centre - Rounding out the collection is a skate shoe, the DC Centre. It is from around 2002 and has a very futuristic look with a smooth black material with grey accents and patent details. Also different about this shoe is the construction is very wide and the tongue is extremely padded. It feels like you are wearing pillows on your feet! These are definitely one of my favorites and I have never seen another one quite like it even from the same company. All of these were worn so they don't have too much resale value, but they do have a lot of sentimental value. Did you own one of these shoes back in the day or have another shoe that is one of your all time favorites? Feel free to share in the comments below. 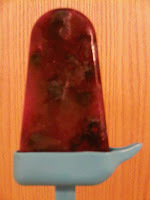 Recently, I got the idea to make my own ice pops using juice and frozen fruit after having success with the frozen fruit beverage idea. I had looked online for ice pop molds at online stores like Amazon, but put off getting them until I just happened to see one of them on clearance at Target. They had one by Jelly Belly called "Lickety Sip Ice Pops". I'm not sure how Jelly Belly is involved with ice pops but it was only $2 so I decided to get it. I got it home and started making the first batch. I decided to try a few different combinations with different juices and different frozen fruits in each one just to make them a little more fancy. I was surprised at how much fun it was to actually make them. It felt like a science project or something. Once they were made, I put them in the freezer to freeze. The next day I tried them out. It was a little hard to get the ice pops out of the mold. They recommend putting it in warm water, but I just tried to wiggle it out by hand. It took about a minute to get it out of the mold. Overall the pop turned out well. 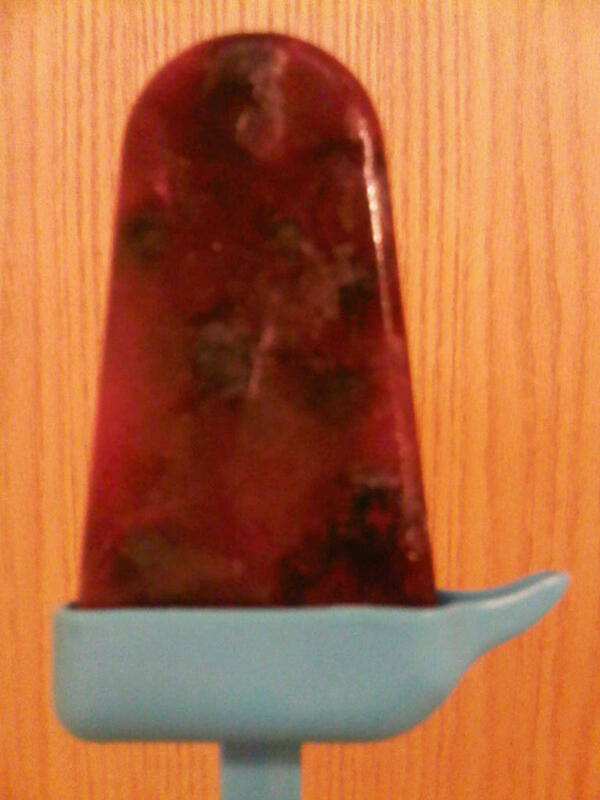 It had a good shape and texture with the juice and frozen fruit. The only down side I would say is you have to be careful not to spill while eating them because juice can drip into the bottom and can spill out of you tip it sideways. Overall I would probably make them again, but I find just having the juice with frozen fruit mixed in is easier and tastes just as good if not better. It is more fun to make the pops but for convenience and neatness, I would probably stick with the juice vs the ice pops. 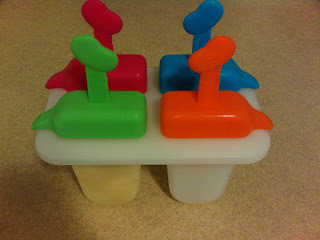 If you are looking to make your own ice pops, I would recommend the Jelly Belly ice pop mold. Many people who work full time jobs have time off for the weekends and holidays such as Labor Day. It is good to have breaks from work like this but the problem is that so many people are on the same schedule taking these breaks at the same time. 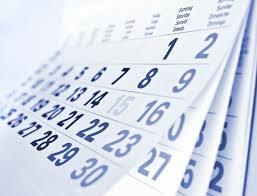 When many workers take the same days off, it makes it so regular everyday things cannot get done and must be delayed until the weekend or holiday break is over. The thing is, the world does not stop for these days, so by having so many people off of work, it causes an inconvenience for things that need to get done. I have already had 3 examples of this situation in this weekend alone. The first is when I was making some changes on my car insurance. I had a question on something so I went to contact the company for assistance, but of course no one was available because it was a weekend. Next, I noticed there was in issue effecting one of my websites. It was on the hosting end so there was nothing I could do to fix it. I tried contacting them because it was a pretty significant issue making my website not work. Again, since it was a weekend followed by a holiday, I still have not even heard back or gotten any help on this issue. The 3rd example took place in my building where there was some repair work that needed to be addressed with the plumbing. Usually there is on site staff to address issues like this, but because of the weekend and holiday, it will not be fixed for several days. I have no problem with people taking time off but the fact that we are in the habit of so many people taking the same days off is causing a problem. It would be better if everyone took the same amount of days off but spaced them out on different days throughout the year. For example instead of taking Saturday and Sunday off, you could take Monday and Tuesday off. It might make it a little more difficult to arrange events with other people but at least this way there would always be coverage for any issues that arise each day. I personally work most days, weekends and holidays included if possible. This may be why I find it annoying when there are days when it seems like everything is closed or people are away when there are still important things that need to be done every day. I doubt something like this will change any time soon, but it could be a big improvement over the current system where we are taking days off in a world that does not stop. 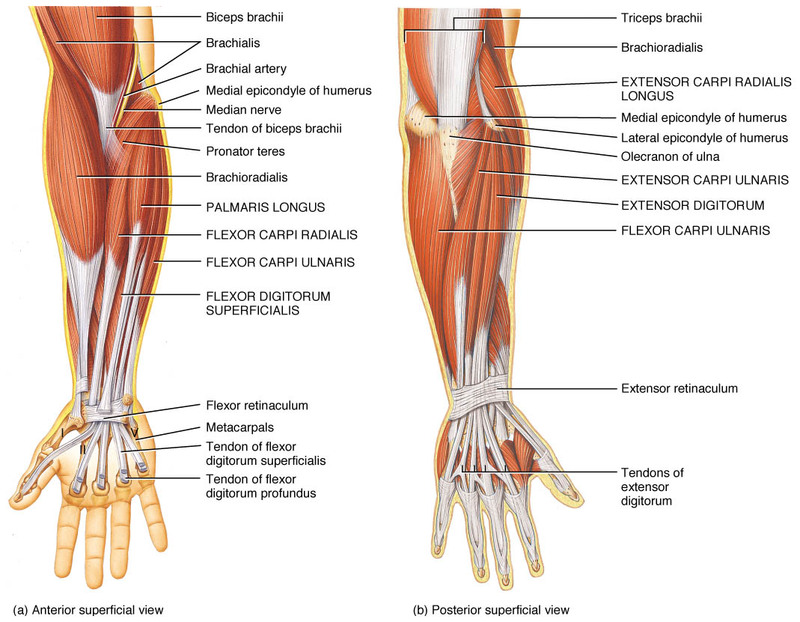 Recently I began to get a twitch in my left forearm just below the elbow. I'm not sure what caused it but it lasted for a couple days before finally going away. I tried stretching it and maneuvering it in different positions as well as massaging it but nothing seemed to have any effect. It seemed to be most noticeable with the elbow bent at 90 degrees. After it went away on its own, I figured it was gone for good, but a couple days later I was lifting weights and it started twitching again. It lasted for a few hours and then went away. A couple days later, I noticed it started twitching again, this time after I was carrying some heavy groceries. So it seems to be connected to muscle use or overuse. An internet search shows there are many others who have muscle twitches and have trouble getting rid of them. Some of the suggestions to limit muscle twitches including eating a balanced diet, avoiding caffeine and nicotine, reducing stress, and getting plenty of sleep. 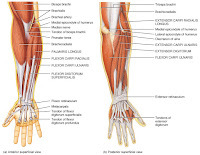 Overall the muscle twitches are not painful, but can be pretty annoying especially if you are not doing anything which makes it more noticeable. Anyone else getting muscle twitches or have any tips for how to treat this condition? Feel free to leave a comment below. Update 11-17-15: The twitching was on and off for a while but now it has gone away thankfully. I guess it was just a temporary issue with the muscle. I tend to live a very safe and low risk lifestyle, always following the rules and avoiding dangerous or risky situations. I work from home and rarely go out which also minimizes the chances of ever running into a bad situation. Because of these reasons, I would never expect to find myself in any sort of trouble. However one time recently I did manage to get into some trouble as you will see. So my main job involves working in sales and customer service for a large company that sells products online. A little while after working there I got the idea to start my own website related to the company to help promote the products and bring attention to the new items released each day. I figured there were not really any websites or blogs doing this for this company so it might be a niche market to explore. I started my website and slowly built it up trying to write a new article each day. I figured after a while I might be able to join an affiliate program and generate a little income by promoting the products. I also figured if I got enough traffic, I might be able to make some money with ads on the website. Over the months the website started to gain traction and get a decent amount of traffic. 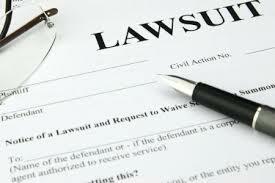 Then one day I was contacted by the legal team at the company. I had been using images from the company website to help promote the products on my blog. I don't think they had a problem with most of the images but at the time I had used some images that apparently they did not want published yet. They had accidentally published them already which is where I got them in the first place, but then they unpublished them and wanted me to do the same. Of course I complied and took the images down immediately and actually unpublished my website until I got confirmation from the company on what was ok and not ok to use. Still before I even had a chance to reply to them, they contacted my website host and then the host contacted me telling me I had to send them all my information. Overall I was pretty worried. I didn't know what kind of trouble I had gotten myself into. I was just trying to make a website to help promote the products for the company and now it looked like they were trying to sue me for using images from their website. So I replied to them and explained the whole situation letting them know I had removed the images and was willing to take down my site or modify it as needed in order to comply with whatever was required. Luckily they were understanding and seemed to be ok with it since I was cooperative and took down the images as requested. I was able to keep writing articles on the website but I no longer use any images for the articles just to be on the safe side. Thankfully the issue was resolved without any serious trouble. My site however did take a hit from the whole situation. I lost a lot of traffic by having to unpublish it for a while and take down all the images. I did continue to keep working on it and with time the traffic came back. This situation turned out ok, but it shows you can get into trouble pretty much anywhere even without even leaving the comfort of your own home!